Pia Camil at the New Museum | The Bottom Line "The Drawing Center"
Pia Camil’s A Pot For A Latch is on view at the New Museum of Contemporary Art through April 17th, 2016. From the entrance of the New Museum’s Lobby Gallery, Pia Camil’s installation A Pot for A Latch resembles a drawing by Sol LeWitt of a moiré pattern of repeated grids. Camil tells Karen Rosenberg in an interview for Artspace that LeWitt and drawings by Agnes Martin inspired the formal structure of the installation. I imagine that walking through A Pot for A Latch feels the way walking inside one of LeWitt’s geometric drawings might feel. Camil relates her work to her experience of visiting one of the biggest markets in Mexico City, La Merced, which “spills out into the street [….] It’s really dense—one grid wall after another after another,” displaying mostly black market goods. Camil often saw modular grid wall panels used to display goods in stores in downtown Mexico City, where she was born and continues to live and work. For this installation, Camil designed her own grid walls specifically for the Lobby Gallery. Painted bright red, the grids form dizzying, shifting patterns of lines and geometric shapes. 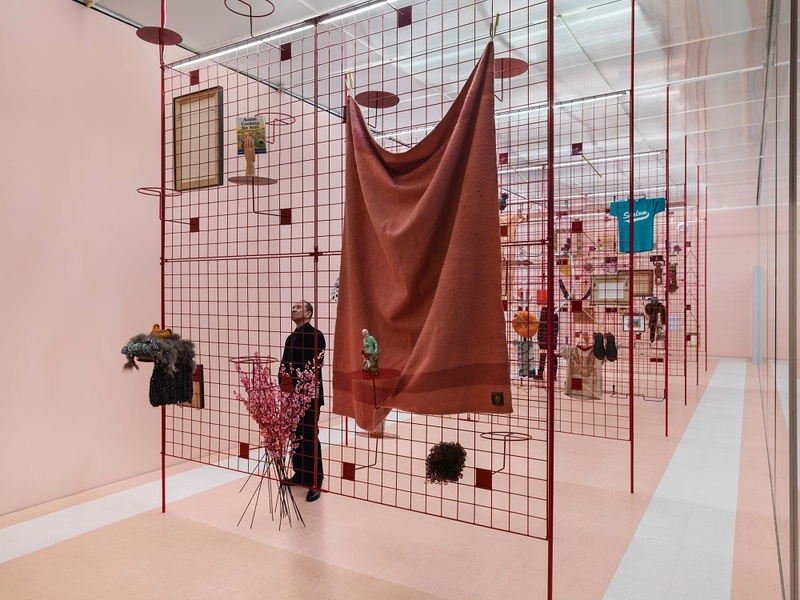 In a series of six public events, visitors are invited to exchange their own objects with those already installed on the grid, and are given a limited edition sweatshirt designed by Camil (created with a collaborator) as a token of thanks. In her invitation, Camil specifies that visitors should bring objects that are totemic, imbued with both a personal value and a history. She suggests that the monetary value of these objects is insignificant, and that they will be given new life and symbolic richness on the grid. 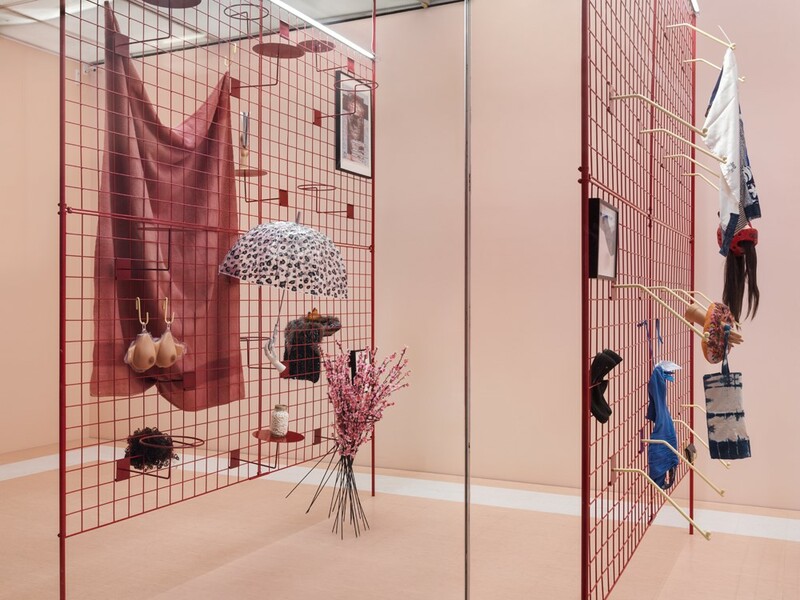 Displayed on the grid walls, these personal objects create a diagram of interpersonal exchange between visitors and the artist. 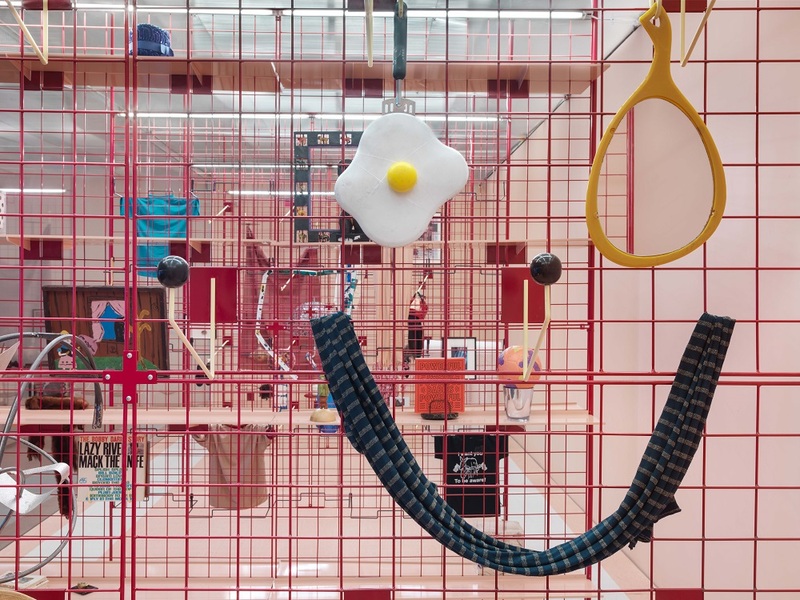 A Pot for A Latch expands upon a project Camil produced for Frieze in 2015, in which she distributed colorful, wearable fabrics to visitors that could become robes, ponchos, picnic blankets, or sheets. These versatile fabrics were based on the “habitable paintings” of the Brazilian artist Hélio Oiticica. Camil forms a vital link between Latin American artists working with minimalist forms (in order to move viewers out of the role of passive observers and into the role of producers) and American conceptualists like LeWitt whose instructional drawings were similarly participatory. Camil’s work combines LeWitt’s serial method and the intimacy of Lygia Clark’s touchable Bichos, 1960, small metal sculptures assembled with hinges so that their shape can change. One might also think of the dimensionality of an early installation by the Venezuelan artist Gego (Gertrud Goldschmidt), entitled Estefa (Sphere), 1959, a field of welded bars and painted steel that create overlapping lines that appear to change as the viewer moves through the space, creating a sense of motion. “For Gego the line, in all its potential freedom, was her permanent muse,” Jenni Sorkin writes in a review of Gego’s 2007 exhibition at The Drawing Center for Frieze Magazine. Camil too, explores the freedom of the line to transverse boundaries between people, places, and histories.